A few months ago, a friend said casually in passing, “I love black eyed peas.” That statement intrigued me. I’d never been too fond of lobia when I was growing up. It was time to revisit these beans. At Journal Square, I found them amongst the rows of glistening jewel-like legumes on the shelf at Bhavani’s. 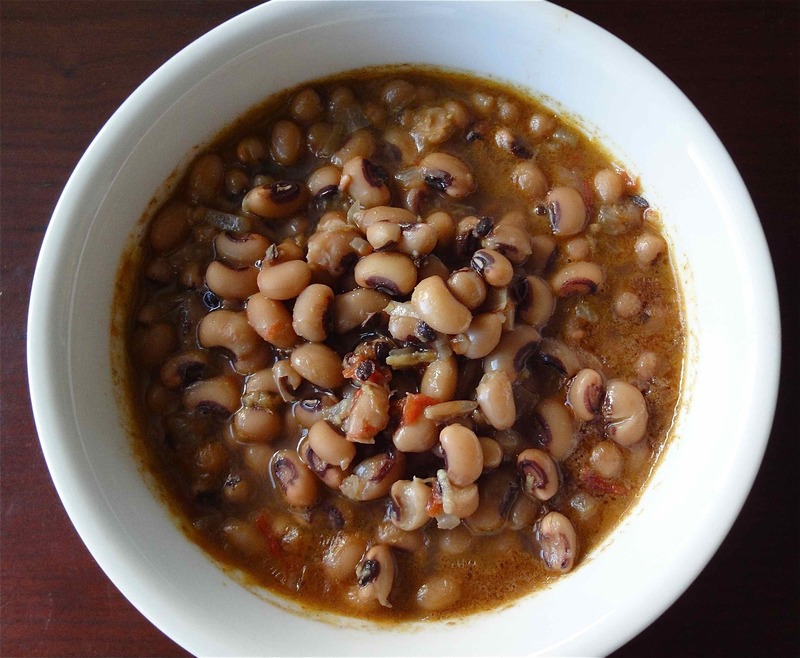 The black-eyed peas were small and perfectly shaped, cream colored with a characteristic dot of black that had another dot of white in it. They felt smooth and warm falling through my fingers while I filled them in a jar at home. Upon cooking, the beans turned soft with a melting texture while retaining their shape. I sniffed and tasted my way through finishing the beans. The recipe turned out to be chole-like, with pieces of whole garam masala: cinnamon stick, black cardamom and bay leaves, with a spot of gur for sweetness. The end result was belly-warming and delicious served with rotis and red onions, instantly popular with the boys, especially my 15-month old, who picked the beans out with chubby fingers. Black eyed peas were here to stay, it seemed. 1. Pressure cook the peas and set aside. Keep the water for cooking. 2. Heat the oil and add all the tarka spices. Allow the cumin to sputter for a few seconds. Add the onions and cook until brown. Add the ginger and garlic and cook for a few more seconds until the smell of garlic is released. Add the tomatoes and cook on medium heat until the oil separates, stirring occasionally. 3. Add the cooked peas, a good measure of the reserved water and the dry spices. Bring to boil, turn down the heat and simmer for at least 15 minutes. This is an important step as it brings all the flavors of the dish together. Remove from heat and serve hot.